I would guess that You would have to cut the floor out and weld in a flat and lower seating peace of metal. To mount the seats to. just get a coupe and screw the 4door. 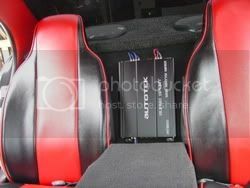 then go REALLY ricer and cut all the interior out but the front seats for max weight loss! ok so im just kidding. it doesnt look bad but im not sure how much i'd like it. But really looks like it would take some welding of some sort of brackets to the floor pan so you could use the factory mounting points on the seat track. But then you would have seats that would not recline or slide too far back, (kinda pointless) leaving you at just leaving the normal seat in the back. 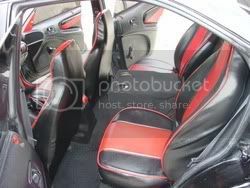 Plus re-doing the seat belts on top of it. It's ok to be different, but being silly just makes you look bad.